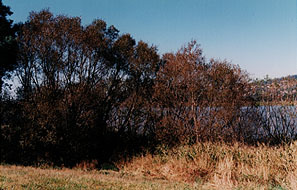 Growth Habit: An erect tree growing up to 20 meters tall in rivers and watercourses throughout Tasmania. The tree has a prolific root system. The stem divides many times at or near ground level. When established it displaces all other vegetation and has the ability to encroach on and eventually block watercourses with its root system, diverting the flow and causing bank erosion and flooding. It’s fallen branches often block rivers causing problems for river users. Both branches and twigs are very brittle at their bases. The twigs easily snap off with a characteristic, audible crack. Type of Plant: Deciduous tree. Flowers: Male flowers in 6-10 cm catkins. Leaves usually between 8-18 cm long. Fruit/Seed: Tasmanian Crack willows are a male clone and it does not seem to hybridize quickly with any other willows. Dispersal: Floods, high winds and increasing age all contribute to the trees breaking and dropping limbs and twigs. Almost any limb or twig that comes in contact with the ground will put down roots and go on to produce a mature tree. In the past, well intentioned attempts to remove large living trees with chainsaws and heavy equipment also contributed to this problem when the twigs were dislocated and rooted in the mud in the immediate area or further downstream. Distribution: There is no doubt that crack willow poses a serious environmental threat to Tasmania’s waterways and stream side vegetation. It will require long term commitment from the community to successfully remove it from the river system. It is as yet an undeclared weed in Tasmania. Status: Crack Willow is a declared weed in Tasmania. The extensive root systems and rapid spread of this tree causes blocking of waterways and the diversion of water to other pathways. This can cause both erosion and flooding of nearby areas. The characteristic shedding of twigs and branches during floods and high winds and the ability of these to put down roots means that all Tasmanian waterways are at risk of infestation or reinfestation while even one crack willow exists upsteam. Prolific growth and the competitiveness of the root system, means that these willows can completely dominate and replace the native vegetation severely affecting its ability to support the native fauna. Accumulations of debris caused by the brittle nature of the tree can cause obstructions for recreational boat users. In the past these willows have been used successfully to control some areas of erosion. Large scale removal of these trees may have unpredictable effects on nearby erosion, silt stabilisation and the availability of platypus habitat. Removal programs now tend to kill the trees in situ, leaving the roots to stabilisation the banks while replacement vegetation is encouraged. Every situation is different and requires careful planing if the spread of this weed is not to be aggravated. Planning permits may be needed where work will alter the water flows in rivers and creeks. Contact the DPIF for details. Trees provide abundant pollen for bee keepers at a time when other pollen (protein source) is scarce for the bees. Similar Plants: There is now much evidence of the hybridising of willow species. Crack willows can be distinguished from others by the upright nature of the twigs, the characteristic brittleness of the branches and twigs, the redness of rootlets growing in the water, the emergence of leaves weeks later than other willows and the cracking sound made as twigs are broken off. For further information contact the Department of Primary Industry and Fisheries, Tasmania. The recommended small books below will help with identification and planning a program of willow removal. Before controlling willows along a stream or river bank, suitable replacement species need to be established to stop erosion of the water course banks. Mechanical control by dozing or crab grab systems are effective means of extracting mature trees from within the water course. Care must be used in order to stop bank erosion due to massive soil disturbance using this control technique. There are no herbicides registered to control willows. Trials are being conducted using Glyphosate 360/Roundup, Brushoff, Garlon 600, Tordon TCH, Kerosene and Ammate to determine their efficacy on willows.